Details relating to the Monaco Commemorative of 2011. This, the second commemorative coin to be issued by Monaco, commemorates the wedding of Duke Albert II to Charlène on 1st July 2011. Charlène was born in Zimbabwe and was previously a well known South African swimmer. In the inner circle are the portraits of Albert II and Charlène. At eight o’clock is the mint mark cornucopia and at four o’clock the symbol for the engraving department. Along the bottom of the inner circle, is the inscription "MONACO 2011". 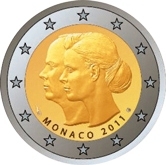 Return from Monaco Commemorative 2011 to euro coin collector.